Following Cades Cove Loop Road in the Smoky Mountain National Park, Tennessee is like driving into a pastoral painting! This drive has been on our bucket list for many years. Friends have told us about the wildlife, the beauty and history of the road, but no description is adequate! 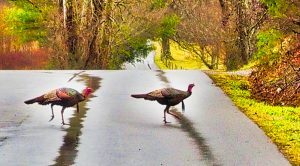 One reason we wanted to visit Cades Cove is because wildlife of all kinds fills me with wonder and excitement. (I should clarify that all wildlife does not include snakes!) 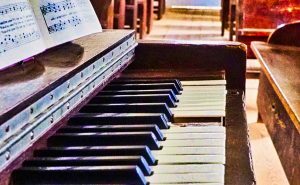 After I retired, I lived in a 400-square foot cabin in the North Carolina mountains. My cabin was across a dirt road from a bear sanctuary but I never got to see a bear. The nearest town had bears checking out restaurant dumpsters daily but I never got to see one! 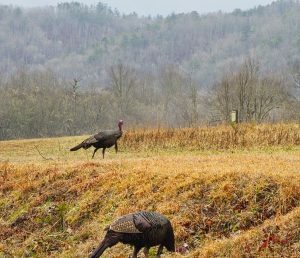 Cades Cove is in a valley surrounded by the Great Smoky Mountains and is home to white-tailed deer, black bears, coyotes, ground hogs, turkeys, raccoons, skunks and other wildlife! Sightings of wild hogs and river otters are not uncommon. Secondly, Stu and I are also history buffs. 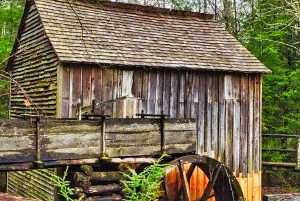 A visit to the famous Cades Cove has been near the top of our travel wish list. 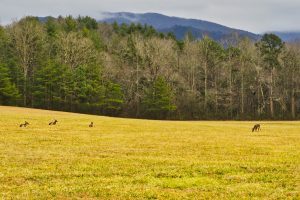 Cades Cove was settled in the early 1800s. 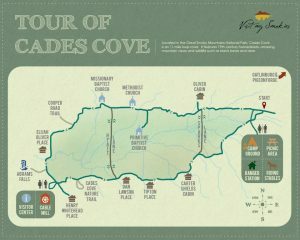 The Park Service brochure says that, in 1821, 685 people (132 families) lived in the Cove. 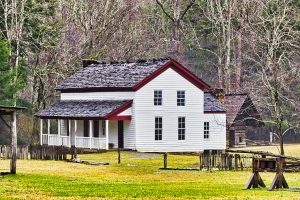 In 1900, approximately 125 families lived in Cades Cove. 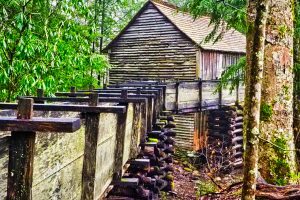 Log cabins, churches, stores and a grist mill for grinding meal dotted the landscape. 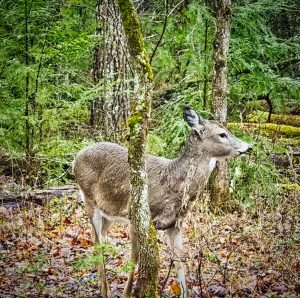 The Cherokee are known to have hunted in Cades Cove but no evidence has been found that they lived there. Carter Shields Cabin. George Washington Shields was wounded at the Battle of Shiloh. 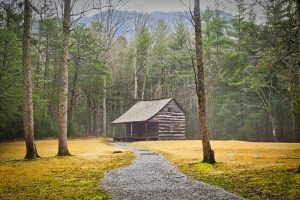 He moved to Kansas but returned to Cades Cove in 1906 and bought this place in 1910. 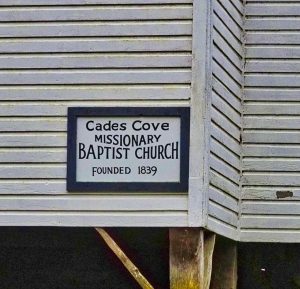 The Park brochure also says that when Cades Cove was a farming community, an unpaved two-way road followed the same route as the Loop Road today. 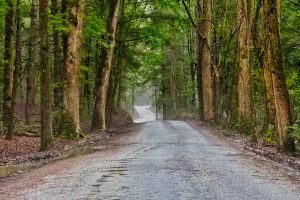 The Cades Cove Loop Road is a one-way, paved road that follows an old logging trail. “Cove” is a regional term for a small valley. The Loop Road circles the entire cove and is free. We entered the Loop at Laurel Creek Road which is at the northeast corner of the Cove. It was raining when we left Townsend, TN to drive to Cades Cove. Like magic, as soon as we started the Loop Road, the rain stopped. The day we visited, temperatures were in the 50’s so we drove with windows lowered for better vision. 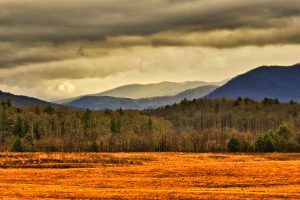 Even though our chance to drive the Cades Cove Loop Road came on a rainy morning in February, there were some distinct advantages. Over 5 million visitors drive the Loop Road each year. We only passed one car during the entire 11-mile one-way drive! We have been told that summer crowds can make the drive very slow. We don’t mind slow. In fact, with no one else on the Loop, we drove as slowly as we could and stopped for photographs everywhere! 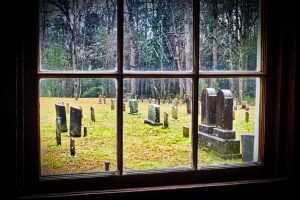 Seniors, if you like peaceful places, Cades Cove is one of the most peaceful and serene places we’ve visited. 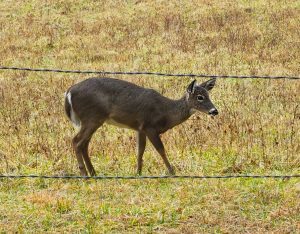 Wildlife abounds and they are not shy so it is a great place to take your grandchildren! Since our drive took place in February, we didn’t see any bears (they often hang out in the trees along the Loop Road). 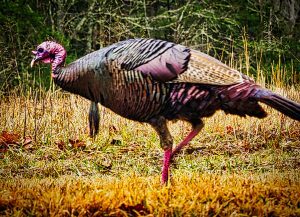 We DID see dozens of deer and wild turkeys. 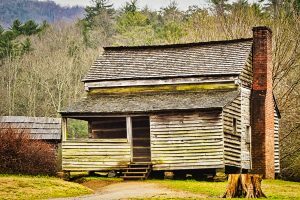 Cades Cove’s history includes European Settlers and the Civil War. 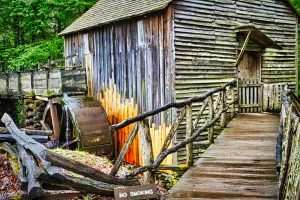 There are 18th and 19th century cabins, three churches and a working grist mill along the Loop Road. There are also many hiking trails (one 5-mile round trip trail leads to Abrams Falls). 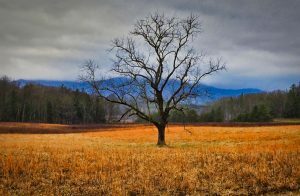 Even though our photographs show the low clouds and wet conditions the day we visited, Cades Cove is exquisitely beautiful. The Loop Drive winds through stunning scenery. Tipton Place settled by Revolutionary War Veteran, “Fighting Billy” Tipton in the 1820s. This larger cabin was built in the early 1870s. Dan Lawson Place built by Peter Cable in the 1840s. Lawson was the Cove’s wealthiest resident. Did we find wildlife? Well, no bears. But take a look! Deer came right up to our car! 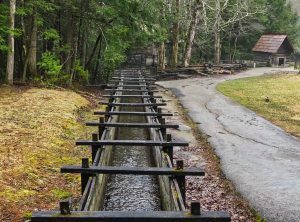 Cades Cove Campground C-1-12 and 26-61 are open year round as is the Cades Cove Picnic Area. 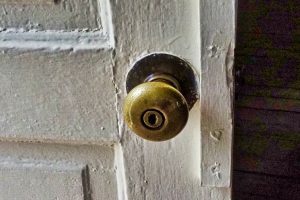 Check www.nps.gov about facility opening dates. In 2019, dates are delayed due to after effects of the government shut-down. Cades Cove Riding Stables (March 2-November 30, 2019) www.cadescovestables.com (865) 448-9009. 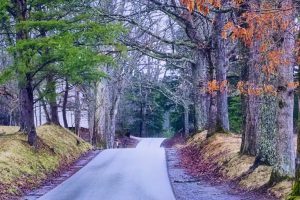 Cades Cove Loop Road is perfect for seniors and their families. 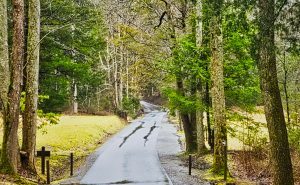 The drive is leisurely with plenty of car pull-outs, places to picnic, inspiring views of the Smoky Mountains and its wildlife. Plan for at least 2 hours. We couldn’t believe how beautiful Cades Cove is! Along with 5 million others, we cannot wait to return in the summer or fall. Maybe we’ll finally see a bear! GO VISIT Cades Cove!!!! Note: Only bicycle and foot traffic are allowed on the Loop Road until 10:00 a.m. every Saturday and Wednesday morning from early May until late September. Otherwise, the Loop is open to cars from sunrise to sunset daily, weather permitting. Please check the weather before you go, our trips (albeit in winter) were delayed several times because of ice, snow or downed trees on the road. 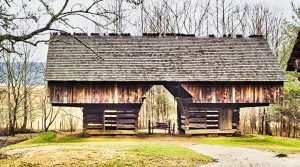 *Cades Cove Tour written by Carson Brewer. 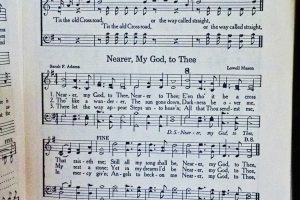 Published by Great Smoky Mountains Association in cooperation with the National Park Service.